Cigar lovers everywhere seem to be locked in a battle of always trying to keep their sticks at just the right temperature and humidity. From humidors to coola-dors to tupper-dors, smokers know that too little or too much humidity will lead to unpleasant smoking or worse, critters like tobacco beetles. Up until now, I’ve used a digital hygrometer to read the humidity in my humidor, and it’s been very unreliable. Lately, it’s stopped giving me a readout at all for some reason. Hygrometers, both digital and analog, require regular calibration, and ultimately, I’m too lazy to do all that….but I love my cigars to be well cared-for. Now, I’ve discovered a device that does what I need, and allows me to be as paranoid at monitoring my moisture levels as I want: Sensor Push. 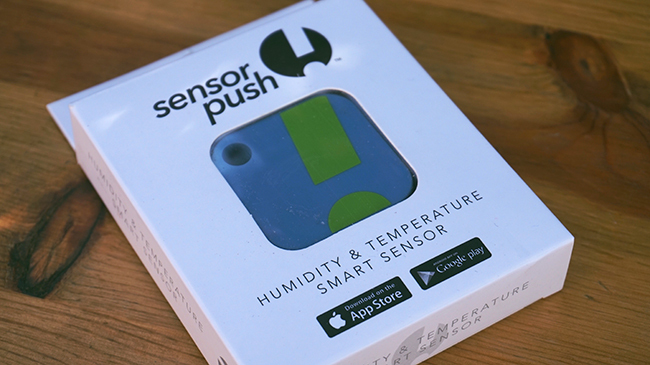 A small self-enclosed device that is just set-it-and-forget-it, Sensor Push gives you temperature and humidity readings on an app in your smartphone. Each sensor retails for $50 at Amazon and you can use as many as you’d like. Setting up a Sensor Push device is easy: open their free app, then tap “add device.” Hold your sensor up to the screen, and it conpairs. It connects with bluetooth from the device to your phone, so as long as you’re within 30-50 feet of your sensor, it’ll constantly send data to your phone. If you’re not close enough to the sensor, though, it stores data up to 20 days while it waits for your phone to be back in range. Sensor Push has also introduced a wifi gateway for $100 that allows you to monitor temperature and humidity from anywhere you have internet. It’s not required, but if you’re away from your sensor a lot, you may want to consider it. I’ve been using 2 Sensor Push devices for the last 2 weeks, one in my humidor and one in my living room. I’ve been really happy with the data the app provides, especially compared to my old junky hygrometer (which consistently reported the wrong humidity). Above are some screen shots of the Sensor Push app at work, just click to view the image in high-res. Note that on my humidor sensor, I’ve set a range of temperature and humidity I want it to remain at. If my humidor drops below 58% humidity, it warns me with a notification. 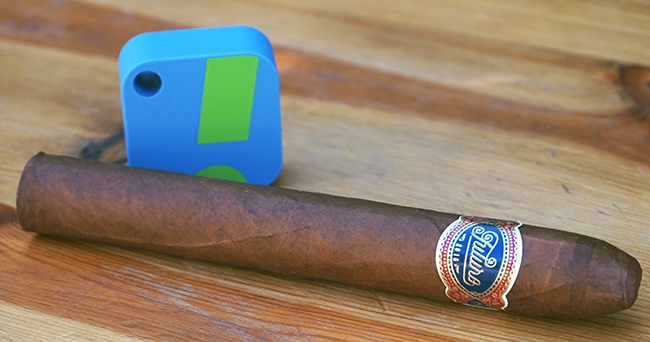 As a cigar smoker who lives in a desert climate, Sensor Push is proving to be invaluable in the both accuracy of its data and the long-term outlook of using the device. The company says battery life is 1-2 years and calibration is basically never required. This entry was posted by admin in cigars, electronics and tagged ios hygrometer, iphone hygrometer, phone hygrometer, sensor push, sensor push humidity monitor, sensorpush on April 5, 2017 .